2017 is coming to a close, but left a blistering path of metal in its wake. This list features my top 10 favorite metal albums for the year. The albums are listed, but there is no particular ranking. Without further ado, let us dive into the pit. 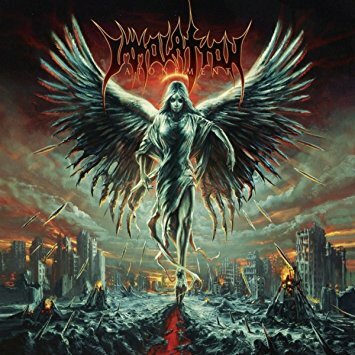 Immolation’s 2013 release Kingdom Of Conspiracy fell a tad short in the songwriting department. However, the band more than compensated for it on Atonement. The songwriting and musicianship rip and weave like a disjointed hellish beast. A fitting album title for sure. While the band’s debut The Life I Remember bordered on nu-metal at times, it showed promise. Evolution shows a more confident, polished band that have upped the musical complexity and the heaviness. This record seamlessly mixes metalcore, djent and melodic death metal to strong results. A brutal history lesson on the Roman Empire, The Immortal Wars is the soundtrack of gladiators. One listen of “The Roman” will have you hailing caesar while disposing of your enemies one by one. Electric Wizard proves it is still a doom metal force on Wizard Bloody Wizard. This record is packed with distorted, psychedelic sludge and occult melancholia. “Mourning Of The Magicians” is a funeral march that is as triumphant as it is unsettling. England’s most loved (and hated) black metal band continue its roll from its predecessor Hammer Of The Witches. The band’s lineup from the previous record is intact, and it shows on Cryptoriana that they are comfortable playing with one another. This album centers around the gothic underbelly of Victorian England thus the guitar work is both baroque and brutal, similar to Jekyll and Hyde. Well done lads. This band has rediscovered its death metal roots on its recent albums and Medusa is no exception. This is not a bad thing as the band has modernized its older sound. The growling vocals fit the downtrodden riffs that has defined Paradise Lost for 29 years. Max and Igor prove that two is better than one on Cavalera Conspiracy’s fourth record. Sepultura fans are in for a delight as this record harkens back to Arise and Chaos A.D. Thrashing groove is exceptional when it is done right and the Cavalera Brothers prove this by the volume. I am amazed I did not suffer whiplash when I initially heard this album. Profane Nexus trudges and slashes like an unpredictable storm. “The Horns of Gefrin” is a constant barrage of rhythm changes and guitar riffs that leave you battered but wanting more. Iron Reagan’s third record saw release early in the year and was slightly overshadowed by other high profile releases. However, this is a fun record that rages and thrashes with the best of them. The crossover of metal and punk has never sounded so re-energized. Finally after a seven year wait, God Dethroned released the final album in its World War I trilogy. The World Ablaze is blistering assault of machine gun drumming and ear splitting guitars.